The National Nurse Team wishes to express our gratitude to Rep. Earl Blumenauer (D-OR) who became the first co-sponsor of HR 4903-The National Nurse Act of 2006. 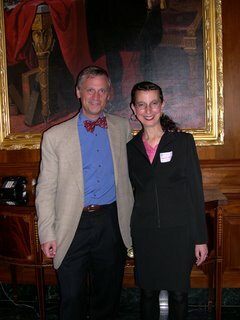 Representative Blumenauer introduced "America's Nurse", the op/ed that detailed the proposal for an Office of the National Nurse into Congressional Record on May 26, 2005 and has been instrumental in assisting the National Nurse Team. Representative Blumenauer commends the National Nurse Team for their diligence in lobbying on the issue and says "The team is an inspiration and proof that citizens really can make a difference. Their dedication leaves me with no doubt that their idea (for an Office of the National Nurse) will eventually come to fruition and I applaud their efforts." And three wOOts for Rep. Blumenauer for co-sponsoring! I hope my Rep will too!! BTW, wasn't it introduced into the record on May 26th, 2005? The article says 2006. Yep, I'm hoping my representatives and others I contact will support the National Nurse, HR 4903. The American public always has NURSES advocating for them, but they need this advocavy on a National level. this is a huge mistake. Not only does it overlook the people actually trained to public health...health educators, is establishes an additional set of priorities which may or may not coincide with Healthy People 2010, our national health agenda. I am all for recruiting new nurses, but doing so by stepping on the toes of other professions will hurt you in the long run.